The Fujifilm X-T1 Mirrorless Digital Camera features a 16.3 megapixel APS-C X-Trans CMOS II sensor and an EXR Processor II to produce high-resolution imagery with an expandable sensitivity range from ISO 100-51200 as well as a top continuous shooting rate of 8 fps. 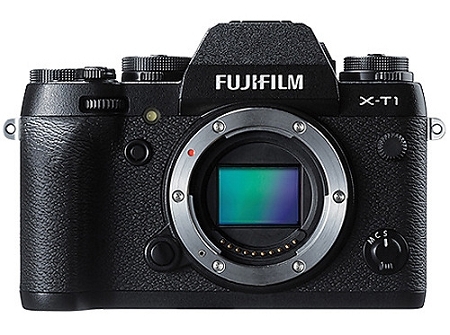 Fujifilm's proprietary X-Trans sensor uses a unique randomized pixel array in order to avoid the use of a resolution-reducing optical low-pass filter, therefore providing images with the utmost sharpness and clarity. This imaging system is benefitted by the Intelligent Hybrid AF system, which uses both contrast- and phase-detection methods to acquire focus quickly and accurately. Enhanced manual focusing capabilities are also a result of these technologies; Digital Split Image and Focus Highlight Peaking are two methods for quickly and precisely determining focus using intelligent focusing aids for improved control and optimized efficiency. For image monitoring, review, and menu navigation, both a 2,360k-dot OLED electronic viewfinder and a 3.0" 1,040k-dot tilting LCD screen are available. The body design extends this versatility through the implementation of manual, physical control dials on the top plate of the camera as well as customizable buttons and a Q Menu button for expedited access to some of the most useful settings. This control scheme further enables an intuitive built-in Wi-Fi system for direct sharing of imagery to an Android or iOS mobile device for instant sharing online. Full HD 1080p movie recording in multiple frame rates is possible and a 2.5mm microphone input permits the use of an optional external microphone for improved audio quality with recordings. Full-time continuous focusing is supported while taking video, also, as well as the use of Film Simulation modes. Film Simulation modes make use of Fujifilm's history of producing both negative and slide films, and allow you to apply those films' characteristics to your digital imagery to better suit your intended look. Rental Includes: Body, strap, body cap, battery, charger, and 16 Gig SD Flash card.